Photo illustration of a proposed billboard as it would appear from the 600 block of Point Street. Although profits from billboard advertising would benefit city organizations, some neighborhood residents and waterfront development advocates are opposed. The ambitious proposals to build a towering billboard and remake Cooper Street in the neighborhood of Rutgers-Camden have genuine merit. 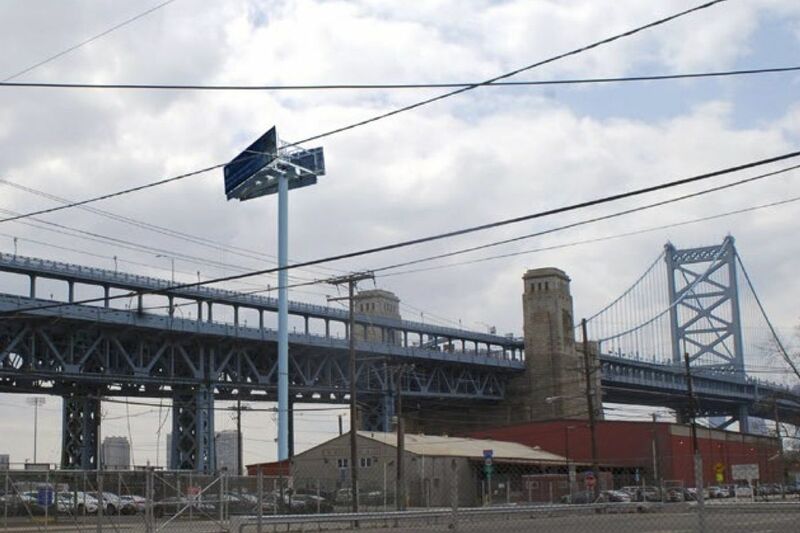 The digital display on a 15-story pole next to the Ben Franklin Bridge would generate an estimated $200,000 annually for nonprofit organizations in the city. The $2.4 million redesign of downtown's handsomest street will include a landscaped, fenced median between Haddon Avenue and Fourth Street, and is expected to enhance traffic flow as well as pedestrian safety. Some local residents see the $1 million billboard as an intrusion on their neighborhood — and on a waterfront only recently made easily accessible to them by demolition of a massive state prison that for decades had walled parts of North Camden off from the Delaware River. And as for that terse Aug. 22 Camden Parking Authority decree imposing a total and permanent parking ban starting 48 hours later along three blocks of Cooper between Fourth and Haddon? Some folks in the city saw it as yet another example of how controversial projects are often driven by, and for, powerful people who live elsewhere. "There's a history of politicians telling residents of Camden what's good for us," said Luis Gaitan, a billboard foe and president of the recently revived Concerned Citizens of North Camden. "The prison was supposed to be good for us," he said. "The trash-to-steam plant was supposed to be good for us." As for Cooper Street: "More lanes and more traffic volume do not make streets safer," Gaitan said. "They're doing this just to create a highway to the waterfront." Drew Katz, chief executive officer of Interstate Outdoor Advertising, the Cherry Hill company seeking the city zoning board's approval for the billboard, acknowledged the painful history Gaitan described. "But there's a difference between people hearing promises that are not kept by those who have a financial profit incentive" and his proposed Camden Charitable Funding Project, Katz said. "Every dollar of profit that the billboard generates is going to be donated to a nonprofit [entity], which will, on an annual basis, distribute all of the funds to nonprofits in the city," he told me. "We will distribute 100 percent of the profits. There's no wiggle room here. There's no ulterior motive." The 47-year-old father of two said he was inspired by the legacy of his own father, businessman Lewis Katz, who at the time of his death in a 2014 plane crash was an owner of the parent company of the Inquirer, the Daily News, and Philly.com. The elder Katz grew up in Camden and as a philanthropist supported many projects and causes in the city he loved. "I had a light-bulb moment that the billboard would be a way I could use my business expertise to benefit Camden," Katz said. The Cooper's Ferry Partnership, a powerful private organization that has evolved into a citywide redevelopment agency, opposes the billboard because "the plan we developed with the neighborhood's input absolutely prohibits billboards," said Kris Kolluri, the partnership's CEO. Cooper's Ferry also is managing the Cooper Street project. The seeming haste to ban parking and re-stripe the pavement into four travel lanes seems to me a step toward making what was once Camden's most gracious address into a waterfront commuter highway. "That's factually inaccurate," Kolluri said. The removal of meters between Fourth and Haddon, and the re-striping of the entire street from Delaware Avenue to Haddon Avenue, were implemented ahead of the planned redesign construction start due to pedestrian safety concerns, particularly around the LEAP Academy University School campus, he said. Kolluri added that studies of the street date from 2005 and groundwork for the redesign began well before the new wave of waterfront office construction started two years ago. Speaking of which, while the impressive new corporate headquarters of American Water is bringing hundreds of jobs to the city, the sparkling glass structure also obscures the dramatic view of Philadelphia that Cooper Street offered for centuries. The redesign project, Kolluri said, is a step toward ultimately "reactivating" the thoroughfare — currently home to hardly any private businesses — for potential retail development between Fifth and Front Streets. As for the billboard, Katz said he just wants "a fair hearing." His project certainly deserves one.